Last week the company I work for had a pot luck to celebrate Christmas and all the hard work everyone has been doing. I came in around lunch time and my boss told me to grab some food before the weekly meeting. I did grab some mac n’ cheese and some corn salad, heated it up in the microwave for a few, and OH MAN, was I in heaven! One of our social workers, Judi, made the delicious corn salad. It was meant to be a cold salad, but not that day! 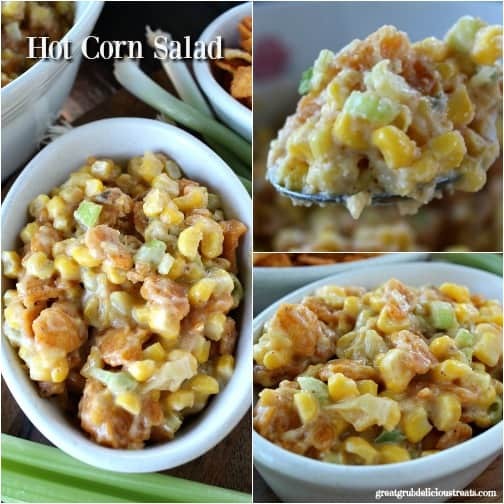 This hot corn salad is a result from our delicious pot luck! Judi told me what was in her corn salad that she had made, so I just added a few other ingredients, cooked it in the oven, and this is the result! SO delicious!! 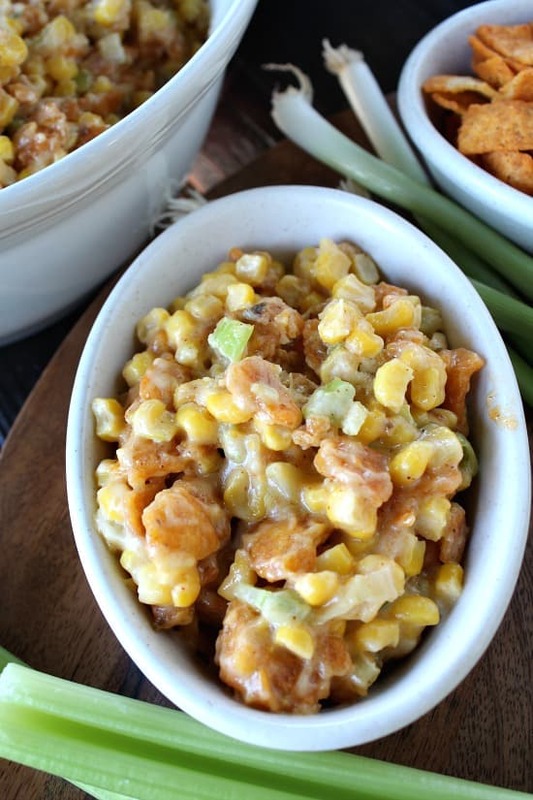 This hot corn salad is the perfect side dish to any meal. 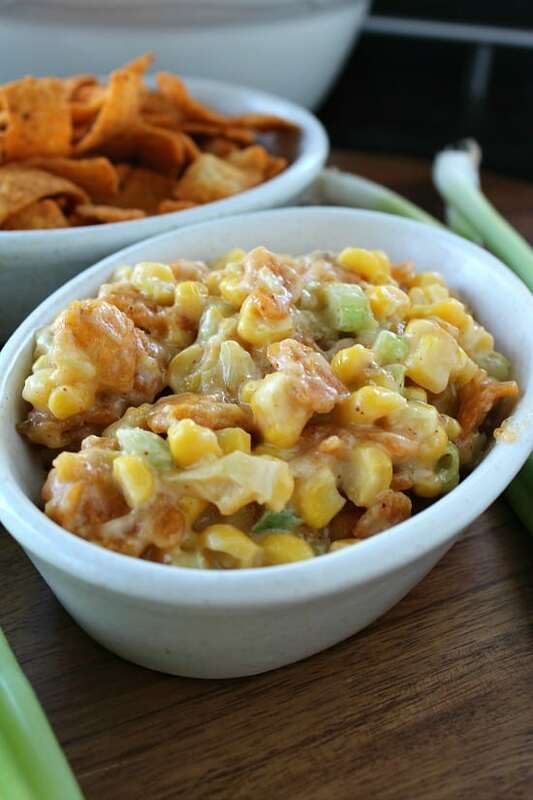 It’s a great appetizer for any game day party or get together too! I have a picky taste tester at times and his response was, “This is GOOD!” Yep, super easy, super delicious and definitely a crowd pleaser! An additional item you can add would be diced green chilies or diced jalapeños. Both would be a great addition to this recipe. There are so many options to change it up a bit each time you make it. You can use a different type of cheese as well. 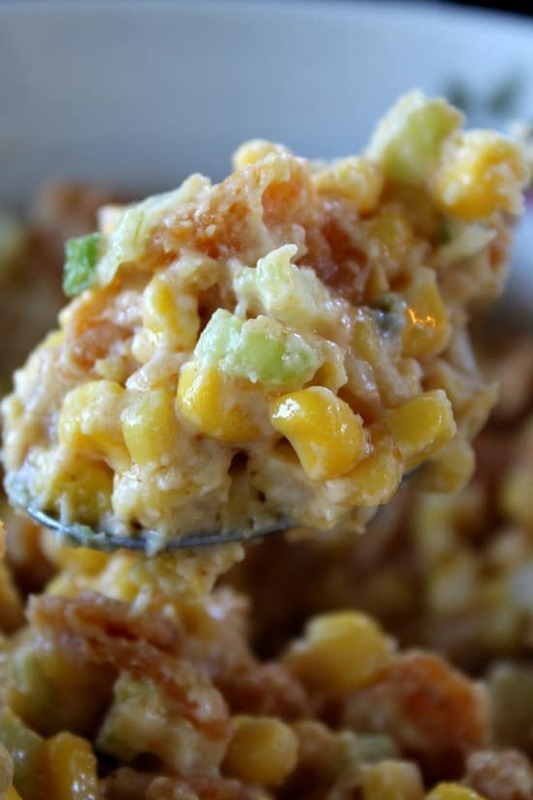 Seriously, this hot corn salad is really easy to make. 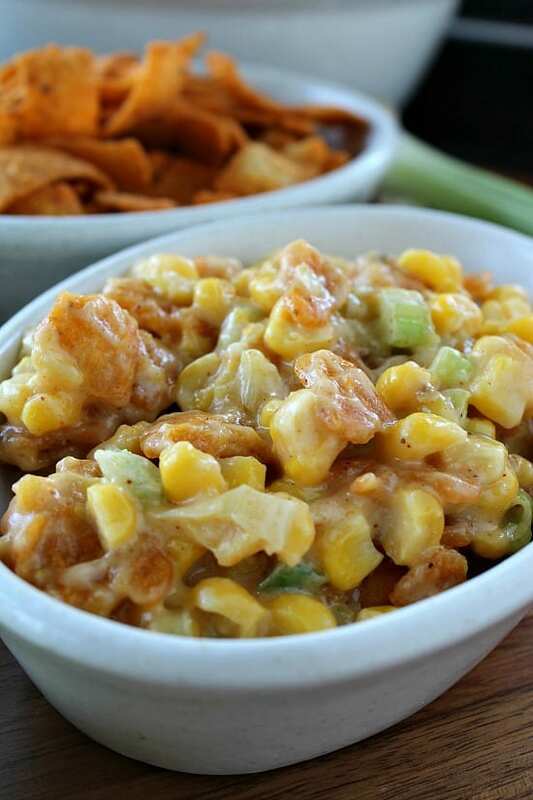 Tomorrow is the perfect time to make this hot corn salad while watching your favorite sports team! 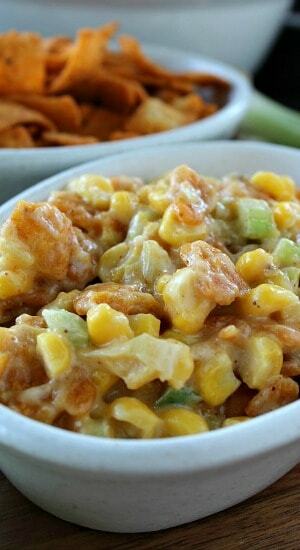 So if you are wanting to try a simple side dish that is quick and easy, this hot corn salad is it! It’s extremely tasty and so yummy! Go ahead, give this a try! You will be so happy you did! Preheat oven to 350° and spray an 8 x 8 baking dish, or a casserole dish, with a non stick spray. Set aside. 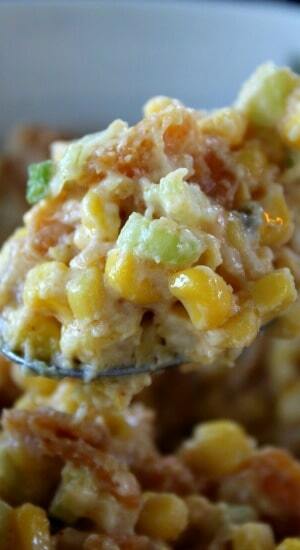 Drain corn and add to a large mixing bowl. 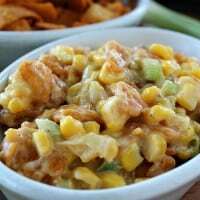 Stir in celery, green onions, mayo, sour cream and cheese. Stir until everything is mixed well. Pour into prepared baking dish and cook for 30 minutes. Stir in bag of coarsely broken up chili cheese Fritos® right before serving. Top with a spoonful of sour cream, optional. Here are a couple popular pins that are the perfect size for pinning to Pinterest! Sounds excellent! I am putting it on my list of things to make for New Years Eve! Hi Terri. I have two words for this salad – YUM-MY! This looks so good. I can’t wait to try it.